Another seminar in the sociology of criminal justice pits attorney Dismas Hardy (Nothing but the Truth, 2000, etc.) against his old friend, San Francisco Homicide chief Lt. Abe Glitsky, and pretty much everybody else in sight. The case seems so open-and-shut it's scarcely worth going to trial. The cops find drunk junkie Cole Burgess standing over the body of Elaine Wager, the ex-A.D.A. now a partner in private practice, with the murder weapon in his hand and her jewelry in his pocket. As if the evidence weren't damning enough, Cole obligingly makes a full confession after his interrogator goes off the record to promise him a fix in return for his cooperation. But Burgess's brother-in-law, influential columnist Jeff Elliot, brings him to Hardy's attention, and Dis immediately picks up some strange inconsistencies between his confession and the crime-scene evidence. Declaring himself for the defense in spite of his misgivings, he has no reason to know that Glitsky had his own personal reasons for sweating the suspect within an inch of his sanity: Elaine was the Homicide chief's unacknowledged daughter (though his patrimony, as later events will show, must be the worst-kept secret on the Left Coast). By the time Abe comes to his own senses and cools down, the case has already gone to the prosecution—D.A. Sharron Pratt, desperate to stiffen her soft-on-crime credentials before reelection by demanding the death penalty, and her political mentor Gabriel Torrey, the chief A.D.A. who tears into the case like a starving man into a juicy steak. Can Dis stop the prosecution's runaway train at the preliminary hearing before it goes to a trial he can't possibly win? 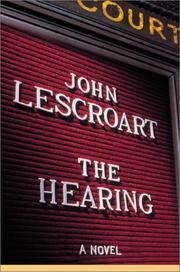 The answer isn't much more of a surprise than the revelation of who killed Elaine Wager, but Lescroart still lays on the political intrigue as fearlessly as if he were writing exposé journalism rather than courtroom drama.